After crossing Moosewood Lake, decided to call it a day. The guide book mentions the Northeast Carry (a traditional portage) and a General Store a few hundred feet down the road. Walked in to find a selection of one or two of a wide variety of products. Owners Ed and Shirley Raymond were chatting with some long time friends and we were soon all getting to know each other. 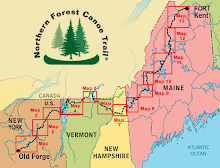 North East Carry, Maine is a fairly remote place, but with all of the outdoor sports and recreation available, they have been able to build up a diverse business. Ed offered me a place to stay next to the store and mentioned that there are "less bugs down by the lake". Bugs were thick by the lake. Ended up cooking dinner and eating as quickly as possible. Shirley made breakfast the next morning, we talked for awhile, then it was off to portage and paddle into the North Maine Woods. Ed made me camp by the lake. Must have liked you better!